Abel Design Group (ADG) recently finished the architecture and design of Mastro’s and Willie G’s, two fine dining restaurants wholly owned by Landry’s Inc. Both restaurants sit adjacent to The Post Oak Hotel. ADG Associate Principal Darayus Kolah directed the interior and exterior architecture of the projects. ADG Principal Dare Lovett served as Principal in Charge. These projects represent the latest in a longstanding relationship with the client. Although Mastro’s is new to Texas, the 11,700SF restaurant features modern materials blended with warm accents for a Southern flair distinct from its counterparts in New York City, Malibu, and Chicago. The exclusive steak restaurant contains one of the largest wine storage rooms in Texas, an outdoor patio complete with water feature, and both private and large open dining spaces. ADG also designed the New York and Malibu locations. Willie G’s has been a staple of the Houston culinary scene since the 1980s. Its new 10,2000SF location across from Mastro’s embodies the concept of casual luxury, which is emphasized through the consistent juxtaposition of rustic and modern materials. 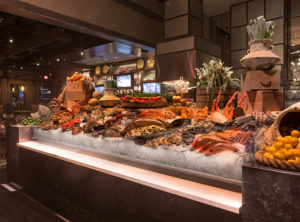 The outdoor patio and water feature wall offer a relaxed environment, and the bustling interior oyster bar provides a unique backdrop to the luxury dining experience. ADG Principal Simona Furini and her team worked in collaboration with the Landry’s design team to select the finishes and furnishings for both restaurants. Founded in Houston, Texas in 2001, Abel Design Group is an award-winning architecture and interior design firm specializing in corporate, hospitality, higher education, restaurant, and retail design, nationally and internationally. Recent awards include PaperCity Magazine’s 2018 Design Award for Commercial Interior Design and Architectural Design: Office, Theater, Spiritual or Public Space, six consecutive years as one of Interior Design Magazine’s Rising Giants, the Houston Business Journal Fast 100 for four consecutive years, a 2017 IIDA Texas Oklahoma Chapter Design Excellence Award, and the American Institute of Architects 2016 Interior Design Award.